About 800 Olympic-sized swimming pools could be filled with the excess milk planned for production over the next 5 years. Between 1982 and 2012, global milk production increased by more than 50% from 482 million to 754 million tons, according to the UN Food and Agriculture Organization. 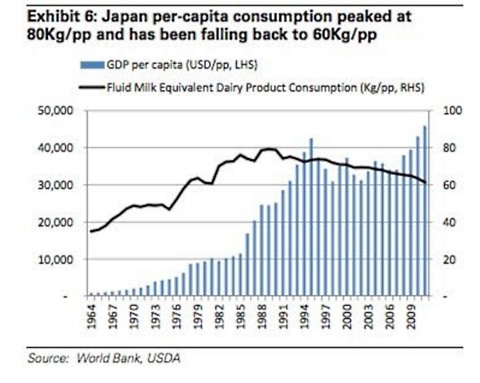 Ok, so we know that milk production is outgrowing demand. But how did milk become such a hot commodity in China—especially when the demand for dairy has dropped off or remained flat elsewhere? 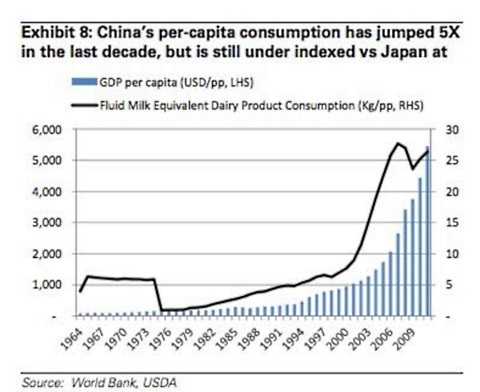 From then on, the Chinese governmental push for milk and dairy products boomed. Imported milk products are especially coveted, particularly in the wake of the 2008 tainted Chinese milk scandal. Milk products aren’t everyday items in China, like they are here. Instead, they’re seen as high-value nutritional items, suitable for children, the elderly, and the wealthy. But China’s booming economic growth has meant a steadily rising number of people who couldn’t have afforded milk before are now eager for the stuff, according to MoneyMorning.com.au. 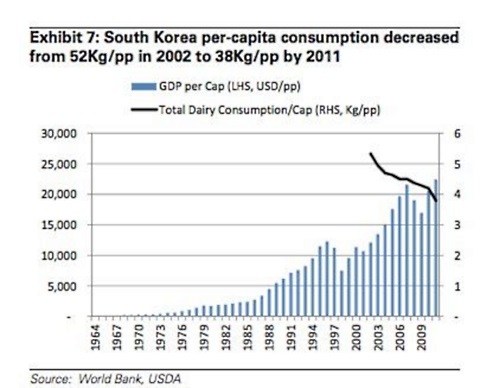 Elsewhere in Asia, milk’s popularity has leveled off or decreased over the same period of time. Regardless of the reason behind milk’s popularity, what about lactose intolerance? Milk is perishable, and even with industrialization extending its shelf life, it doesn’t travel well internationally. For this reason, a lot of milk shipped overseas is sold in powdered form. As the BBC notes, processed milk products—including powdered milk and cheeses in general—have very low lactose levels. Also, not everyone is completely lactose intolerant. Australian dairies have rushed to what Queensland Country Life calls “the White Gold Rush,” and have correspondingly ramped up their dairy production with their sights set on making a fortune in China. Mr. Chen cautioned against setting prices too high, because even though China wants its milk, Chinese consumers won’t buy it at any price. Meanwhile, Quartz reports that New Zealand-based Fonterra, which supplies a lot of milk to China, took in so much money last year that it’s amping up its milk production to an all-time high. We think someone really needs to commission those Olympic swimming pools for excess leche.